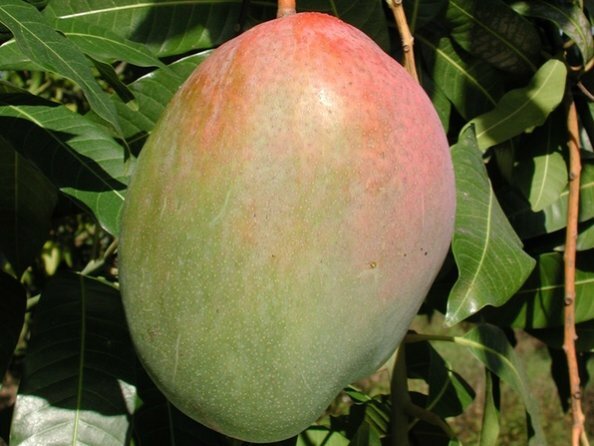 &QUOT;KEITT&QUOT; IS A FLORIDA SELECTION WHICH HAS BECOME ONE OF THE WORLD'S MOST OUTSTANDING MANGOS. EXCELLENT EATING QUALITY, DISEASE RESISTANCE, PRODUCTIVITY, AND RIPENING TIME ARE SOME OF THE FEATURES OF THIS FOUR TO FIVE POUND GOLIATH. WHILE THE FRUIT ARE EXTREMELY DISEASE RESISTANT, THE JUVENILE TREES ARE EXTREMELY DIFFICULT TO GROW DUE TO DISEASE PROBLEMS. FOR THAT REASON WE HAVE SUSPENDED PRODUCTION. THE FRUIT RIPENS FROM AUGUST TO OCTOBER.